Disney Stars magazine follows different themes each month from the newest and biggest Disney brands. Previous issues have featured, Cars, The Lodge, Disney Princesses, Tinker Bell and Disney Animals. Buy a single copy or subscription to Disney Stars magazine. 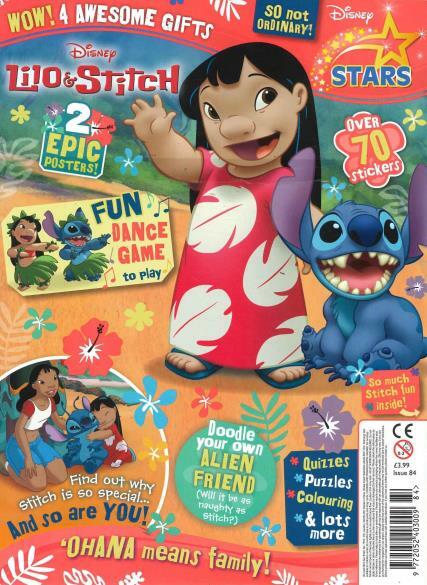 Disney stars is aimed at boys and girls aged 3 to 7 and features all the top Disney brands of the moment. The magazine engages fans with an in-depth look at new characters, celebrates old favourites and introduces the latest stories. Each issue is filled with fun activities, puzzles and colouring pages. Plus, posters of favourite Disney characters, stickers and free gifts.